I ended up having one leftover kit from the CC1 beta test and I thought that an experience builder might like to build it. There are a few minor mods to perform to the PCB, so it’s best suited for someone who feels comfortable with that. The (hopefully) final PCB spin is coming soon and will be slightly different, but this version works well, as AA7EE can attest to. I can offer the kit for a discount over the final CC1 retail price, and it’s currently available for 20 or 40 meters (although the final retail product will be available for more bands). Contact me at milldrum at gmail dot com if you are interested. I’m not subscribed to the SOTA reflector, but I saw a post on the VK3ZPF blog that there was an announcement on the reflector that there will be a SOTA 12 Meter Challenge. I think this is a great idea and I want to support it if I can. I haven’t made too many 12 meter QSOs, but when I have it seems like the DX has been pretty easy picking. When it’s open, the band seems quiet and the signals sound great. The plus for SOTA activation is that a resonant antenna is small and easy to pack. My original plans for the CC1 were to only support up to 15 meters, but I think I may add 12 meters in order to support this initiative. The DDS in the CC1 is clocked at 50 MHz, so technically I should be able to output a 24.9 MHz signal, although I don’t know in practice how well this works at a frequency so close 0.5 Fc. If I can get it to work, I will release it as an available band on the CC1. 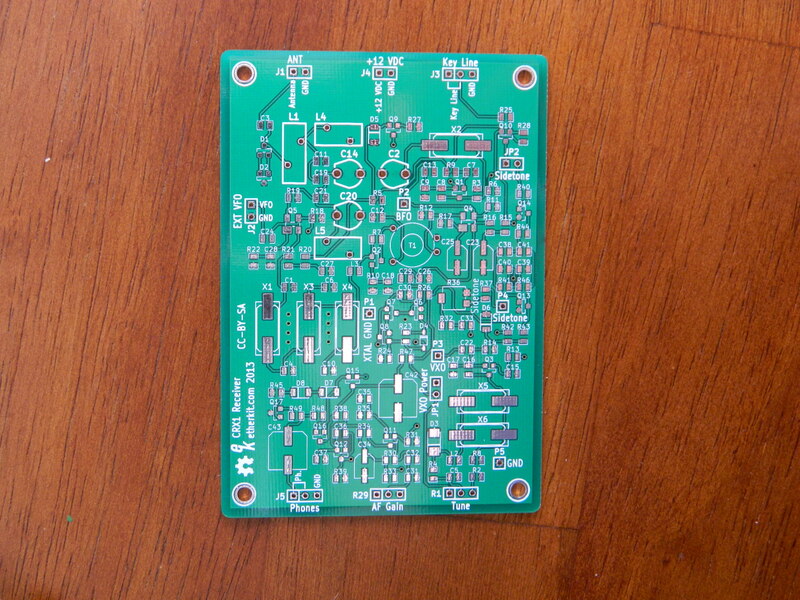 Here is the latest beta PCB from the Etherkit, the CRX1 receiver! It is all-SMT construction, but I spread out the components a bit more than the CC1 and all of the parts are on one side of the PCB only. It’s VXO-tuned for the 40 meter band (a few kilohertz around 7.030 MHz) and is based on the Clackamas transceiver which I entered into the 2010 FDIM Challenge (which means it’s also a cousin of the CC1). This receiver has only discrete components (size 0805 resistors/caps, SOT-23 transistors), so it should be fairly easy to build. In other words, a good warm-up for the CC1. It also has a port for an external VFO, so it will be a platform for experimentation as well. I’ll build this PCB up today and verify that it works, then get a few beta testers to confirm that all is well. Hopefully I can get this product onto market fairly quickly, with a low price. Stay tuned for more details as work progresses. I’ve added some new gear to my For Sale page that would be a great addition to the bench of any homebrewer. Please stop by and take a look!